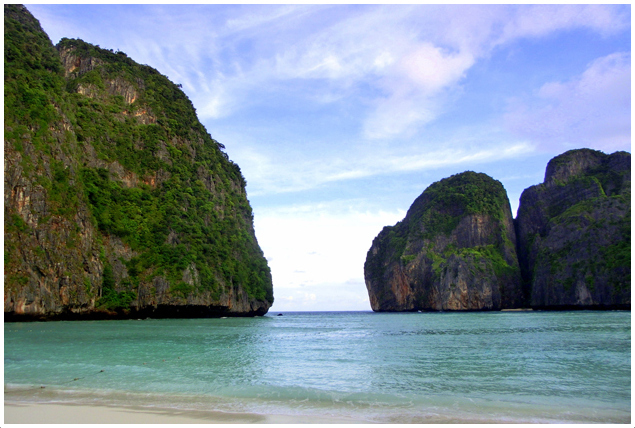 Maya Bay captures the spirit of Thailand, perhaps, like no other place in the country. If for no other reason, take Hollywood’s word for it. Parts of Leonardo DiCaprio’s film, "The Beach," were filmed on the bay’s sandy beaches and has mesmerized film goers since. 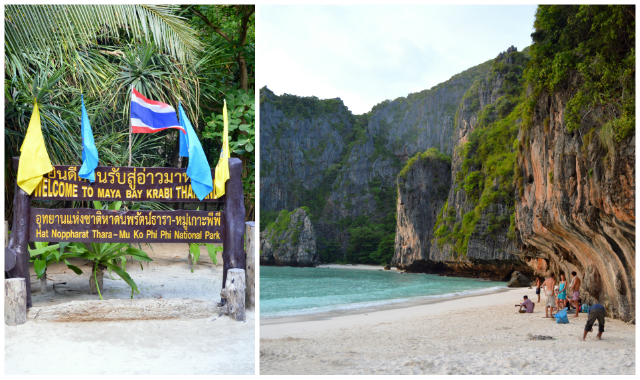 Maya Bay has the best of everything Thailand offers: giant limestone cliffs, crystal blue water, lush foliage….and hoards of people. Unlike DiCaprio, who finds the bay a secluded oasis of spiritualism, most travelers will have to share the bay’s majesty with hundreds of other tourists crammed together on the bay’s small beach. If you’re like most, that lack of seclusion can destroy the lure of the bay. Maya Bay sits just a short boat ride off the main island of Koh Phi Phi Don, - one of Thailand’s most popular tourist destinations. 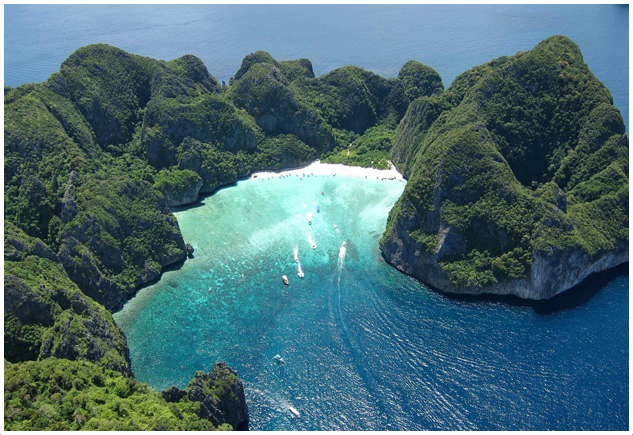 And because of the bay’s proximity to Koh Phi Phi Don, it’s proximity to Phuket (Southern Thailand’s main tourist hub) and it’s flirtation with Hollywood, hundreds of people crowd the bay on day trips originating from these destinations. 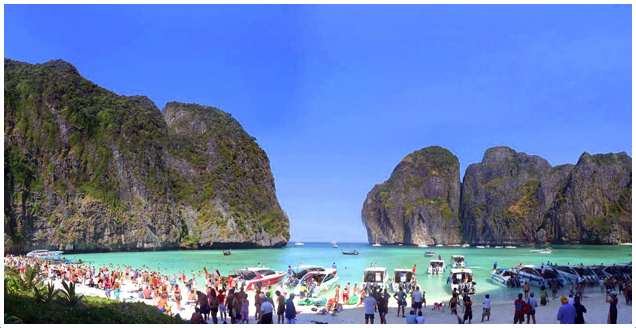 The day trips to Maya Bay can be charted at any travel shop in Thailand and the speed boats that transport the tourists often make the trip several times a day. If lots of people crammed onto a small beach isn’t bothersome, then join one of these day trip excursions. 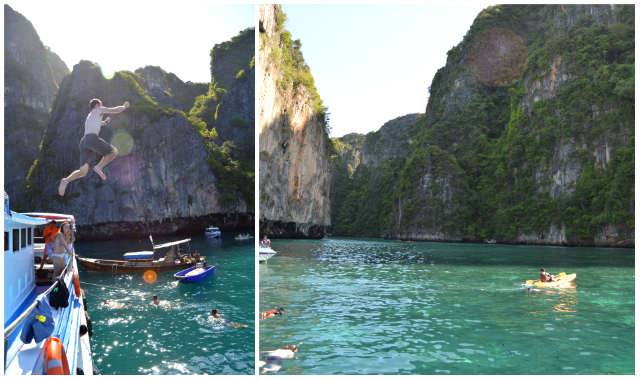 Maya Bay really is worth seeing no matter how or when you get there. For those who seek a grander Maya Bay experience than what 90 percent of visitors get, there’s only one place to get it: Maya Bay Sleep Aboard. Owned and operated locally, but run by an Aussie named Phil, who left the Down Under more than a decade ago after falling for the beauties of Southern Thailand, the sleep aboard tour has exclusive rights to the bay after hours. Originally, the tour camped overnight on the beach but in 2012 the tour company was forced to change strategy. Now, instead of camping on the beach, patrons simply do the next best thing - camp on a boat moored in the bay’s sheltered waters (during the low season, the boat moors at Losama Bay, Maya Bay’s rear entrance where calmer waters make the sleeping experience more pleasurable). 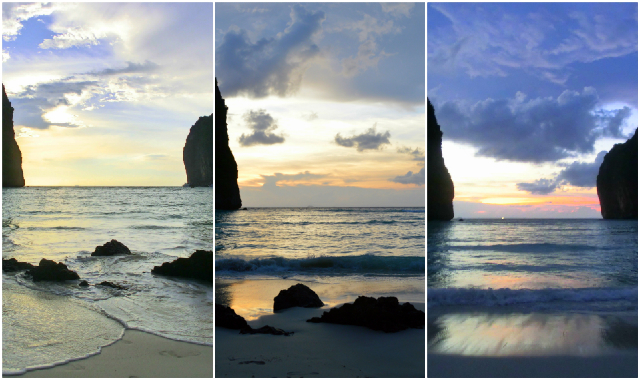 It’s simply the best way to experience Maya Bay. The tour offers the bay the way it was meant to be seen: with seclusion and a laid-back, free-loving attitude. The tour runs like clockwork. Everyday it’s the same schedule. 2:45 pm – 3:00 pm is a type of meet-n-greet where you can mingle with other guests before disembarkation (the group is capped at twenty people, but can be fewer during slow season). The boat is docked at the main pier at Koh Phi Phi and is hard to miss. By 3:30 the boat has left the port and cruises at a leisurely pace so guests can soak in the beautiful views of the islands. 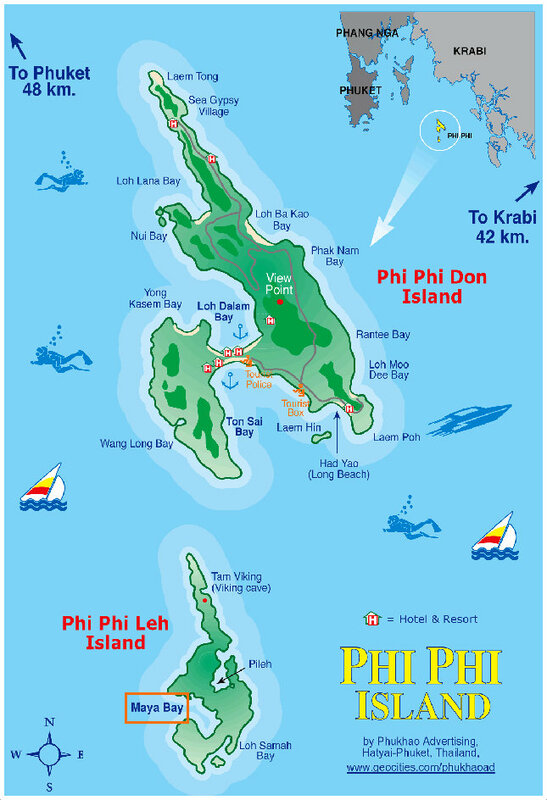 Around 4 pm, the boat lays anchor (or at least idles) at Phi Leh Bay for a dip in the waters and great snorkeling. If you’re brave enough, jump from the upper deck of the boat. It makes for a much grander entrance into the bay. There’s plenty of fish and the crew offers those less confident swimmers the option of snorkeling with life jackets; don’t worry about packing snorkeling gear (unless you prefer your own) the crew stocks enough gear for everyone. If getting wet doesn’t sound like fun take out one of the kayaks they stow on board the boat. After the group has had enough snorkeling the boat makes its way to Maya Bay. The strong swimmers can stroke it in (if the seas are gentle enough) but most guests seem content to hop in the dingy and let the motor do all the work. By the time visitors arrive at Maya Bay dusk is settling and most of the other tourists have disappeared. Pretty soon, you have the entire island all to yourself. Make sure to take in the sunset; you won’t be disappointed. Dinner is served around 8 pm and consists of Penang curry, vegetables under oyster sauce, and rice. If you like Thai food you’ll be pleased. If you’re not a fan, the food options are pretty limited. Bring something to hold you over or bide your time until 10 pm when the tour serves a late snack of barbequed chicken with toasted garlic bread. There’s plenty to go around so don’t be shy. 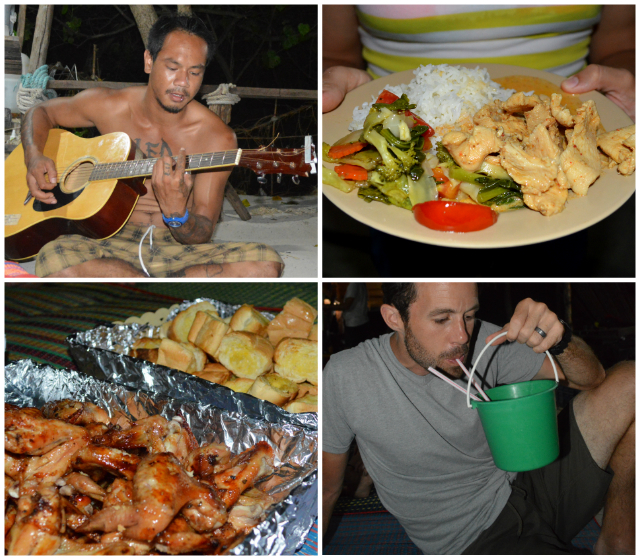 The evening consists of games, socializing, impromptu concerts by the staff, and moonlit strolls along the beach. The tour includes one free bucket of Thai rum and coke and for most that does the trick. To add a little extra “party” to the party, patrons can purchase more drinks from the company - an offer many don’t refuse. Around 11 pm, the crew packs up and shuttles everyone back to the boat. And here is where the magic really begins. Those who have swam with bioluminescent plankton understand just how beautiful of an experience this can be. With a little movement in the water, the plankton light up leaving the water glowing like a radiant night sky. The crew breaks out the snorkeling gear again for guests to swim in the waters and take in this magical sight. Some folks are reluctant to get wet again, especially just before bed, but don’t pass up this experience; it’s supernatural. At the boat, the crew has laid out pads and sleeping bags for everyone. Stake out a claim for the night. The top deck provides a beautiful view of the night skies and if you’re not prone to seasickness, outside is the place to be. However, if the gentle rocking makes you feel queasy – and it does for some people – head inside to the center of the boat where the rocking is minimized. In the morning, the crew shuttles guests back to the island to catch the sunrise and one last moment of peace before the hoards of day-trippers arrive. There’s time for more snorkeling, kayaking, and swimming. The crew prepares a breakfast of fresh fruit, toast, and coffee. 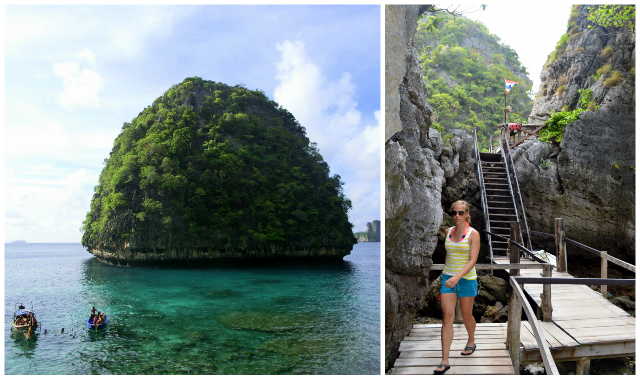 By 10 am the boat returns to Phi Phi Don and it’s onto your next adventure. 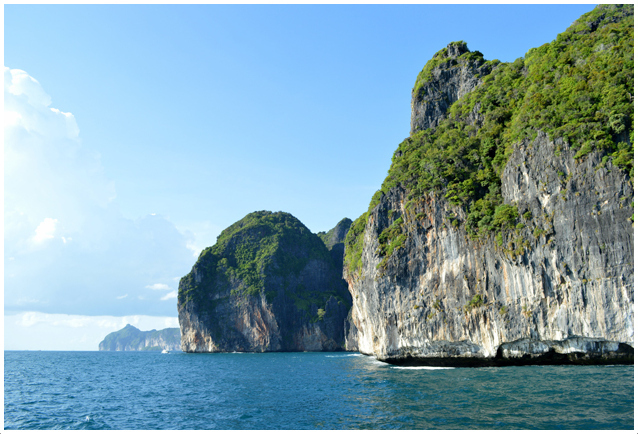 One word of caution, sleeping aboard a boat in a secluded bay in Thailand sounds like a once-in-a-lifetime experience. And it is. From December to March the sea is glass. If getting seasick is still a concern consider the Plankton Tour. It follows the same initial itinerary but once the sun goes down you’re shuttled back to the boat for a BBQ dinner before a dip with the Plankton. Then it’s back to the pier by 9 pm. At 3,000 Baht per person, or roughly $100 US dollars, the cost of the Maya Bay Sleep Aboard tour is worth considering. Many of the day trips are expensive and offer far less of an experience. Remember the price includes a night’s stay, transportation to the bay, snorkeling, kayaking, and about four meals – all of which you’d have to shell out for anyways. 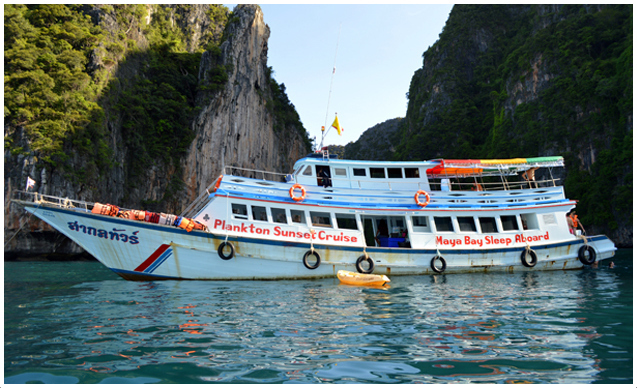 But if the cost seems too steep, the Plankton tour is a third of the price and includes a secluded Maya Bay, dinner, and Plankton swim (although, sleeping under the stars and then watching the sunrise over Maya Bay is marvelous. So splurge! How often will you get such an opportunity again?). The best way to book is on their website www.MayaBayTours.com. The Maya Bay Sleep Aboard Tour runs nearly every day of the year, so judging on availability there’s a great chance the tour will be in operation the day(s) you’re in Koh Phi Phi. But make sure you book early, as space is fairly limited. If you decide to go during the low season, there’s more wiggle room and it might even be okay booking last minute. 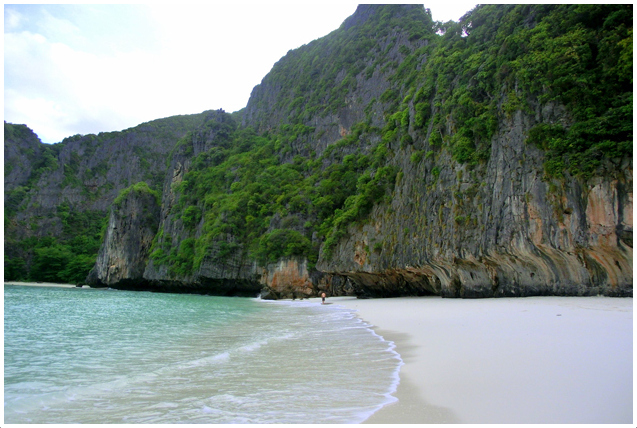 Maya Bay Tours is reputable and reserving online is safe. If the tour gets canceled due to rain or rough seas, the operators provide a full refund. The tour directors are pretty good about communication. You can email them directly with any further questions at phil@krabikonnect.com.